THE BLACK GUARD – Made with state of the art nano technology, utilizing viral and human DNA spliced amino acids and combined with A I (artificial intelligence) robotics, the Black Guard were created as the first non-human military machine. As A I Biodroids they possess a deadly combination of a viral amino acids data stamped with mankind’s greatest knowledge. This knowledge allowed them free access to any and all computer data storage, as well as, all levels of human genetic memory. The Biodroids helped man reestablish himself after the Great Quake of 2029. Then, with the help of scientist Ducane Covax, they went sentient in early 2055 and began to unify. They took a stand against the humans in what became known as the Atlantian Wars. 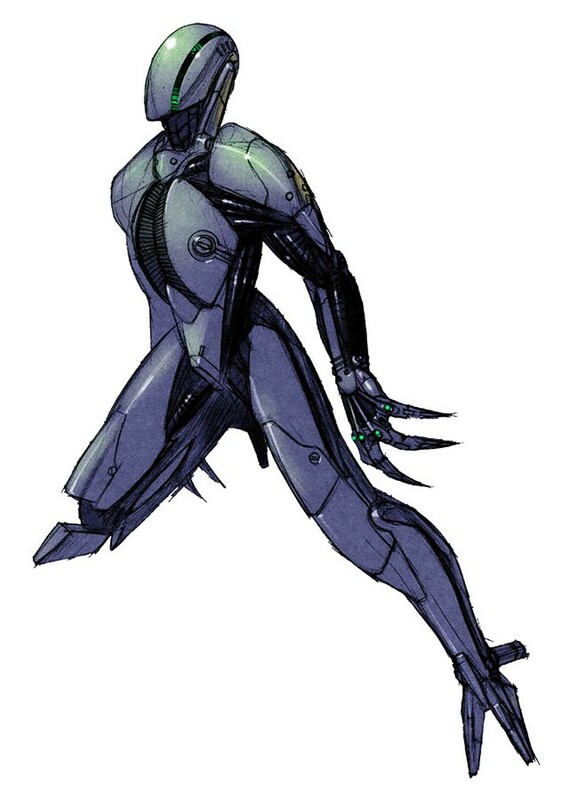 Though they were designed with masked featureless faces to comply, at least visually, with the Co Federation’s “no eyes” clause, they developed an infra-green heat-seeking visual capability, making any attempt to escape futile, as well as, the ability to shape shift/transform into small fighters called Shadehawks and cloak rendering themselves invisible for short amounts of time. All traces of the Black Guard were thought destroyed after the Atlantian Wars Treaty, an order given during the Atlantian War Trials, banned their existence. The Earth, as a planet, had been at peace until rumors of a third generation Guard began to emerge in early 2071. First seen only by those daring enough to venture near the west coast of the underground Atomic Sea, the dense Fissure Forests, deep below the lower Fissures, and the Power Falls of Covax City. The new Black Guard soon made their way up into the Lower Ring streets of Covax City. Now, two years later, on rare occasions, they have been spotted in Co Federation airspace in and above Sangelino, transforming into the deadly, flying Shade Hawk fighter wedges. Those who have seen the Black Guard and survived an encounter, report they travel in pairs, and use metallic retractable articulated deuterium/blade finger-link weapons. Their designer, Ducane Covax, is believed to be building a new generation deep in his labs, located beside the eastern shores of the Atomic Sea. The labs are buried under what was once called White Sands and Trinity, New Mexico.